The Meeting was held at St Edburg’s Church Hall, Bicester. Sixty three members and two guests were present at the meeting. Pete Chivers introduced the speaker, Liz Woolley, who had made a study of everyday lives of rural people across Oxfordshire, particularly during Victorian and Edwardian times. 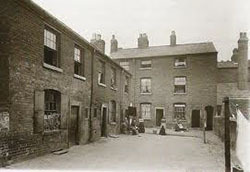 Common Lodging Houses provided cheap accommodation during the nineteenth and early twentieth centuries. They could charge as little as 2d a night for basic facilities. Mattresses cost extra! They were used mainly by the poor and gained an unfortunate reputation as they were associated with unsanitary conditions, overcrowding, delinquency, promiscuity and raucous behaviour. 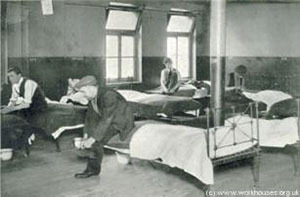 Common Lodging Houses could be found in most towns. Many were located in London and locally in St Thomas’s High Street in Oxford where more than twenty were concentrated to the west of the city centre. In Banbury the lodgings were located at Rag Row, and in Wantage at Grove Street. A variety of buildings served as common lodging houses in Oxford ranging from substantial properties, pubs that doubled as lodgings and even cellars in some northern cities. The lodgings often housed the landlord, his wife and family and in some cases over thirty residents. 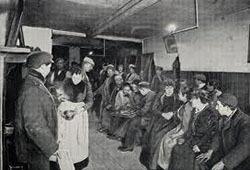 The kitchen was often the heart of the lodging house. It was where people would eat, do their washing and socialise. A mixture of residents lived on the premises. The impoverished, work shy, and those lacking morals were credited with residing in some lodging houses. Male lodgers tended to be single, women were mostly married. The residents originated from all over the country but the majority were local. A spike in numbers of Irish immigrants accompanied the Irish potato famine in the 1840’s – 1850’s. A variety of trades and jobs characterised the residents occupations, namely, beggars, street sweeps, hawkers, entertainers, fallen women, labourers, domestic servants, match sellers etc. Labourers could be employed as builders, agricultural workers, railway navvies etc. Many people bought goods from hawkers in Victorian times rather than from shops of the period. Work was often seasonal with workers travelling around the country as need be e.g. shoemakers. A proportion of the residents would have lived by crime. 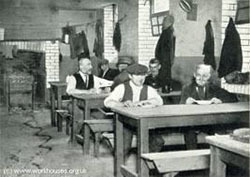 Many preferred to reside in the common lodging house rather than be housed in the local workhouse. Some people were long term residents. Lodging keepers had a poor reputation. A number were disabled although many were local people to the area and lived a far more settled existence than the residents. Common lodging houses were important in their time as influencing the supply of labour, patterns of migration, providing popular entertainment, for their treatment of the poor and influencing the development of country towns in the county. Pete Chivers thanked the speaker who answered questions from the audience. The Meeting closed at 8:45 pm.